About ten years ago I became a live kidney donor - when I donated my right kidney to my younger brother. After the transplant I wrote in with a factual correction to a national newspaper when they mistakenly wrote that women cannot have children after donating. 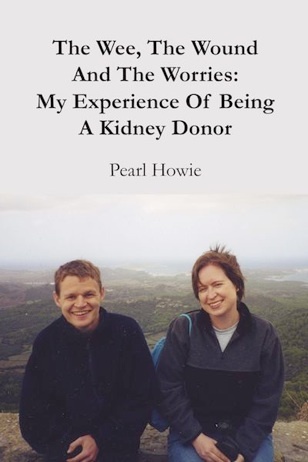 I was inundated with requests for advice - so I put together all of my experience in this short and frank book for anyone who wants to know more about kidney donation. The book guides readers through the decision to be tested as a donor, the pre-surgery tests, (such as the angiogram), the surgery itself, different pain management techniques, the common maladies I suffered afterwards, the emotional impact of the donation and my long term fitness. It even explains what happened when sadly the kidney stopped functioning and my brother had to start having dialysis. “Thank you so so much for your kind words and advice, it has really given me so much to think about and to be grateful for. “Having read your book this morning on-line, you have given me so much hope and the reason to keep going now. There’s also been one rather negative review which you can read my response to here.